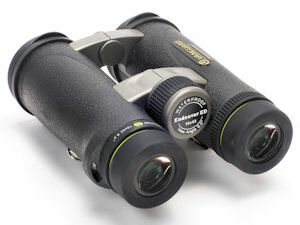 Endeavor ED binoculars are Vanguard’s finest bird and nature-watching binoculars. The Endeavor ED binocular line is comprised of four models: the more traditional 8x42 and 10x42, and the plus-sized 8.5x45 and 10x45 versions, plus an option of camouflage armoring. We greatly preferred the 42-mm models, so this review only discusses those. 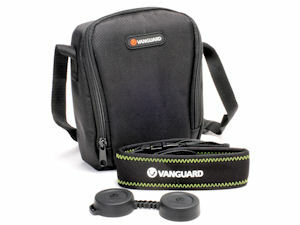 Since we’ve not previously reviewed any Vanguard products, it is worth talking a little about the company. At this time of writing, Vanguard has been around for 25 years. They started with a high-quality line of photography accessories like their excellent camera bags and low-cost, carbon fiber tripods. Then they branched out into sports optics with several lines of spotting scopes and binoculars. We’ve been keeping an eye on them over the years, and when this latest version of the Endeavors came out, they were too good to pass by, especially at this price point: both the 8x42 and 10x42 models in black armoring cost $299.99; a Mossy Oak Finish version of the 10x42 is available and runs $369.99. So now we are talking an HD-glass binocular at under $400. That got our attention, and it should hold yours. 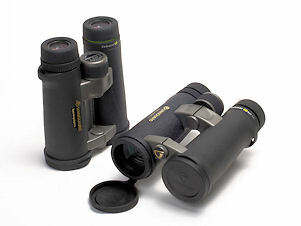 Physically, the Endeavors are fairly typical for a roof prism binocular: they stand about 6.4 inches tall by 5 inches wide, with eyecups fully extended and hinge wide open. They weigh about 27.5 ounces, which is just a bit above average for this class of binocular. Like all modern roof prism binoculars, they are O-ring sealed and purged with dry gas (nitrogen, in this case) to be completely waterproof and internally fog-proof. One major feature is the open bridge design of the binocular: there is space between the two hinges for at least two fingers, if not three, which makes holding them steady very easy. Vanguard Endeavor ED binoculars have an interpupillary distance range of 58-74 mm, meaning that if you have particularly close-set eyes, these might not fit your face comfortably, but they won’t trouble most users. The faux-leather surface of the armoring has a crinkled, nubbly feel to it, imparting a secure and comfortable grip. That comfort is enhanced by the shallow and wide divots on the underside of the barrels where the thumbs naturally fall. Ergonomically, the Endeavor ED binoculars are quite good. This is the section where we talk the measurable performance parameters that define a binocular. For example: field of view. The 8x42 Endeavor EDs have a 367-foot field of view at 1000 yards, compared to 340 feet on the 10x42 model. That still doesn’t tell you all that much until you compare it to other binoculars in those respective classes. According to statistics we’ve compiled, the average field of view for an 8x42 roof prism binocular is just about 370 feet, so the Endeavor is pretty average for an 8x binocular. Interestingly, 10x roof prisms average about 325 feet at 1000 yards, so here, the Endeavor is actually fairly significantly above average. So now we’re getting somewhere. 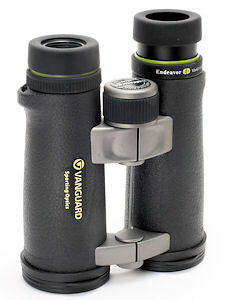 Vanguard lists the minimum close focus for both models of Endeavor ED binoculars as 8.2 feet. We had little trouble getting the either version down to 7.6 feet, so we found them to be a bit better than their published value. Eye relief on the Endeavor EDs was 19 mm and 16.5 mm for the 8x and 10x models respectively, which turns out to be a bit better than average for both models in this trait, and certainly enough for most people to use comfortably. Focusing was intriguing on the Endeavors. First, we found that they go from minimum close focus to infinity in just 0.75 turns of the focus knob. That’s really quick! Most binoculars do this in about 1.2 to 1.4 turns, and there’s a reason for that. If the action is pitched too steeply, you run the risk of blowing past the point of ideal focus; if it’s too shallow, it takes too long to get to ideal focus. But the Endeavor focus mechanism is quite stiff, and this has the practical effect that you don’t blow past the point of ideal focus – you just ease up to it. We don’t know if this was by plan or not, but the net effect is that it works surprisingly well. Vanguard Endeavor ED binoculars are made with phase-coated BaK4 prisms. They also feature a special anti-reflection AR Coating on all air-glass interfaces, which improves light transmission efficiency and image quality. Additionally, Endeavor ED binoculars have a V-Max silver coating which enhances contrast for sharper, crisper image quality. These binoculars also feature the Emerald coating which specifically enhances colors in the green region of the spectrum. Lastly, there is the ED glass itself, which primarily serves to reduce chromatic aberration. We can tell you all about these various coatings, but honestly that doesn’t tell you the one thing you really want to know: how well it all works. It works great! Next question, please… No just kidding! Honestly, the way you test something like this is to pick the binocular up and compare it with other binoculars that are in about the same price class. We noted that the Vanguards had fairly average field curvature, but that they were a bit flatter of field in general and with a bigger sweet spot than at least one of their more well known competitors. We also noted that they did a bit better than average on chromatic aberration, the thing that ED glass is supposed to reduce significantly. In that, the Vanguards placed somewhere in the middle, the caveat being that everything that beat them, costs more than they do. That’s actually an important piece of information. We don’t recommend binoculars that get out-performed by other cheaper optics, and these binoculars didn’t get scooped like that. Instead, their performance was solid and satisfying, given the level of optic we’re discussing here. We grade binoculars on both their optical performance and how they handle the little things that we ask of binoculars in the field. We’ve already discussed focusing. Two other performance traits like that are using the eyecups and making the diopter adjustment. The eyecups on the Vanguard Endeavors adjust with a helical twist mechanism, going through two intermediate positions between fully up and completely down. The intermediate positions were not marked by particularly firm detents, but they were stable even so, which is all you ask for in this. The diopter adjustment mechanism is a twist ring on the right hand ocular: a little white triangle lines up with a raised vertical line in the rubber armoring of the ocular tube to indicate the position for equal eyes. You can twist the mechanism through 4 or more stops on either side of this mid-point. All of that is fairly routine. What makes this mechanism extraordinary, especially on a binocular at this low a price, is the fact that it locks! That is a huge plus for anyone whose eyes are not equal. Setting the diopter is a laborious process, and if the mechanism doesn’t lock, inevitably, you lose that perfect setting, meaning you have to do it again. With the Endeavors, you pull the ring up towards the eyepiece to unlock it, set it in the usual way, and then press the ring back down to re-lock it. So unless someone specifically messes with it, you do it just once and you’re set. This is an awesome feature in an inexpensive binocular. Endeavor ED binoculars come with the usual assortment of accessories. The standard strap that comes with the Endeavors is actually quite nice, with a padded, neoprene-like section that goes round the neck and is almost 1.75 inches wide, which is wider than usual, meaning greater comfort for you. The rainguard is a pair of very pliable soft rubber cups joined by a flexible bridge; it fits snugly over the eyecups and does not dislodge accidentally but is still easy enough to get on or off. A bracket on one side allows the strap to be threaded through it so you always have it and can’t lose it. This is quite nicely done. 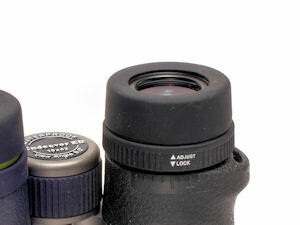 The objective lens caps are of the tethered variety, attached to rings that fit over the objective tube barrels. We found that these worked surprisingly well in the field. They didn’t come off easily. For the record: all ring-tethered objective covers come off at some time – it’s just a question of how often and how easily – these were better than most. They also didn’t close accidentally during testing, which is good. We give Vanguard full marks for executing this well. The case is black, weather-proof cordura with an asymmetric zipper closure. It is nicely padded to shield the optic from bumps and shocks. We would have preferred it to be just a little bit bigger so that the binocular slid more easily in or out of it with the eyecups all the way up. This case works well with the eyecups down, but is a tad too snug with them up. Still, it’s a functional and practical case, and it does just fine overall. That’s pretty much everything you need to know about the Vanguard Endeavor ED binoculars. At $350 for either the 8x42 or 10x42 models, Vanguard Endeavor ED binoculars deliver an excellent level of performance for the cost, which means they are a great value. We think that people who take the time to do their research and actually compare optics in this general price range are going to like the Endeavor ED binoculars very much. For a variety of reasons, we have severed our relationship with Vanguard USA and are no longer selling that brand. Please call for alternatives.